One of the reasons we began DCGreeks.com almost 8 years ago was to eradicate what separated Greek-American young adults in the DC area. Whether it was being from Virginia or Maryland, going to St. George or St. Sophia, or being Spartan or Cretan, we sought to ignore all these barriers and to simply celebrate what we all had in common in the hope of bringing the community closer together. Along the way we've helped promote almost every type of event that has taken place in this town, from Greek nights to dinner dances, to Greek festivals, concerts and beyond. In attending more than our fair share of Greek events though we've started to see that while there is some crossover appeal to certain events, for the most part, the old distinctions have still remained. We've also come to realize that as diverse as the Greek community is here in DC, it can easily and understandably fall into a rut in terms of providing opportunities for Greek-American young adults to get together outside of the typical and sometimes stereotypical settings. It was with all of this in mind that we recently launched our πάμε series. πάμε for those out there who can't read the language is simply Greek for "Let's Go." We realized that with DCGreeks.com, a site that is independent of any of these traditional Greek-American organizations and is not tied to any one promoter, we have a vehicle to assemble significant groups of Greek-American young adults together to take advantage of the events and attractions in and around DC at significant discounts. While the goal would be to have some loose Greek tie-in to each event, the events themselves wouldn't necessarily have to be Greek and would regardless steer clear from the typical Greek event. Our hope in organizing such events would be to get a more diverse group of Greek-American young adults to attend and to perhaps get some Greeks out who you wouldn't normally see at a Greek event. There wouldn't be anything in it for us otherwise as we aren't making a profit any of these efforts. Our first such event was πάμε στο θέατρο back on April 9, 2009 for a $10 showing of Euripides' Ion. To give you an idea of how good of a deal that was for lower orchestra seats, the Shakespeare Theatre's Young Professionals Night which drew and should obviously have drawn more attendees featured tickets at twice the price for seats in the nosebleeds. While many people didn't RSVP through us directly we heard anecdotally about a last minute 'Greek Time' rush of the box-office of random Greek young adults who all were able to have the DCGreeks.com rate honored by the theater. But even in checking the names of those who reserved tickets through the theatre box office in advance we realized that these were Greek-Americans that we didn't know or regardless have never seen at other Greek events in the area, meaning that despite our two weeks notice for the show, we accomplished our desired goals of a πάμε event. 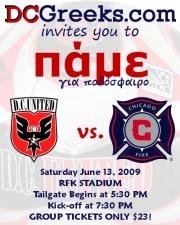 Our next πάμε event is πάμε για ποδόσφαιρο -- an outing to RFK to watch D.C. United take on their Eastern Conference rival, Chicago Fire at 7:30 P.M. Admittedly outside of the fact that this is a soccer game, the Greek tie isn't obvious, as there are no Greeks or Greek-American on either squad (although former Greek-American U.S. National Team and Chicago Fire player Frank Klopas, whose family grew up next door in our family in The Dad @ DCGreeks.com's χωριό outside of Argos still has a position with the team). Still we figured that there are enough Greek Chicagoland transplants in the DC area to add extra interest to a game which should be good regardless because both teams are at the top of MLS' Eastern Conference. If $23 tickets for premium seats right behind United's "supporters clubs" wasn't a great deal by itself, we got our friends at Cava Mezze to donate their signature upscale Greek mezedakia for our free pre-game tailgate starting at 5:30 in the RFK stadium parking lot, figuring that adding free food to the mix would make the event Greek enough for folks to come. Our only worry in putting on this πάμε series is the same worry that has frustrated Greek event planners for years if not centuries or millennia -- the concept of Greek time. Group discounts and getting donations from Greek-owned businesses require having as much of a heads-up as possible as to the potential headcount for an event. While United have promised us great seats regardless of when we put in our first group order, our chances of getting even better seats increase the quicker we can get a critical mass of 20 or more people to commit to the game. Also the sooner we have a head count of how many we can expect at the tailgate, the more incentive we'll have to seek out another Greek restaurant to cosponsor it, with the operative words being "free gyro/souvlaki." So we hope this has served as a subtle reminder to those who might be thinking of coming to the game, to hurry up and reserve your tickets and to encourage your friends to come to ensure that we have more Greeks in the stands and more gyros in our stomachs. So we hope to see many of you at the D.C. United game on June 13th or at another πάμε event in the future. If there are any suggestions for a potential πάμε event or if you happen to be a Greek-owned business that wouldn't mind donating to a future πάμε experience, please shoot us an email at Pame@DCGreeks.com.